Sharp is a worldwide leader in LCD display technology. NBM offers a complete line of Sharp interactive whiteboards, digital display monitors, interactive display systems and digital signage technology to fit your business needs. 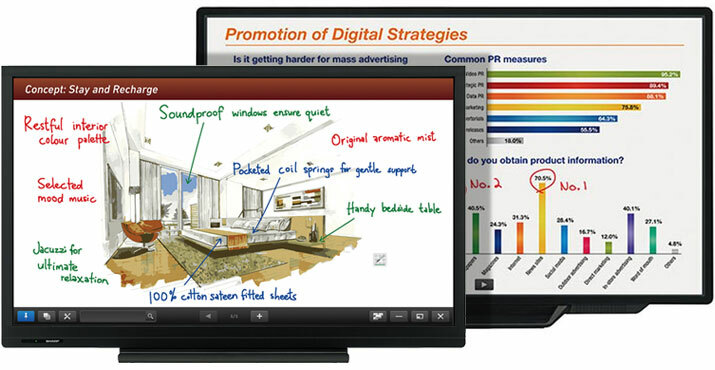 Sharp AQUOS BOARD® interactive display systems are much more than your typical white boards. Designed for smooth and effortless communication in a wide range of contexts, their highly responsive touch pens allow several people to write on the touch screen at the same time. The SHARP Display Connect software enables multifaceted wireless communication. Whether in the office boardroom or the classroom, Sharp changes the way you communicate. NBM also carries Sharp digital display monitors and digital signage technology.